Formatting a larger card at a much lower capacity (e.g. 256MB) does the trick. For example, you can write the SD image that comes with QEMU to your SD or CF card (follow this guide). One of the ROMs is very slow, so it takes a while. Updated the binaries to skip that step. @ 200D/6D2/77D owners: please check whether the new dumpers are still working (same link, top of the page). The 800D ROM dumper seems to work, though it took me a while to figure out how to create a fatfs smaller than the card. "strings ROM0.BIN" and "strings ROM1.BIN" confirm they aren't just non-sense (I'm not sure what else to check). I have a 77d, some sort of programming skills and I'm ready to help in any way needed (if needed). 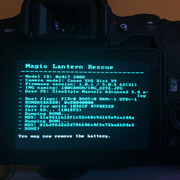 Hi, I want to have magic lantern on my Canon 200D camera. I have already installed this fir document. then he says that I have to put out my battery and restart my camera. if I do that he does nothing... Is that right? Previous dumper should work; feel free to double-check the stubs. Can confirm that 6D2_DUMP.FIR is still working on 6D2 1.0.4. Did 3 runs, MD5 of ROM0 is inconsistent, ROM1 is even. FileMerge detected 69 differences between 6D2.103 and 6D2.104, all memory address related. but the iMac terminal complained: -bash: arm-none-eabi-gdb: command not found. There seems to be a Homebrew problem not installing arm-none-eabi-gdb. Found a script to fix that, but that didn't work! Installed arm-none-eabi-gdb with Homebrew, now I get the following error. How can I fix this? Start all over again? Hi guys! I'm new with magic lantern and don't understand so much about this. Someone can tell me how I install the firmware in 80OD? I didn't understand if I get ML just installing the firmware availably here. Someone can tell me how I install the firmware in 80OD? I didn't understand if I get ML just installing the firmware availably here. There is no ML currently available for the 800D. There is a bunch of work that must be completed first before ML is available for the 800D. do you still need some rom-dumps or something else? Hope i can help a little! Looks very much like DIGIC 7. Dual core. Volunteers willing to run untested code are welcome. Hi there! I own a 6D2. Could you please tell me more about running the untested code? How dangerous is it? If the code damages the camera, will you help to recover it if it's possible (with another code, for example)? I'm kinda experienced Linux user and a Java (with a little C) programmer. Sadly, I'm not much into low-level programming. For DIGIC 7 models, the next step is porting the 80D startup code (i.e. running user code alongside Canon firmware). I expect this step to be straightforward, so it's left as an exercise to the owners of these cameras. You can debug the startup code in the emulator; once you get it working, just ask me to enable the boot flag so you can test it on the camera. After publishing the ROM dumper, I'll update the emulator, attempt to enable the boot flag and get some diagnostic logs. Further progress will require a developer with a camera in their hands and plenty of spare time for experiments. If that describes you, your contribution will be more than welcome. I'll be here to help if you get stuck, but please be aware I'm not interested in maintaining yet another camera port alone. If the code damages the camera, I'll try to help, but cannot guarantee success. Hmm, given that I have no experience in reverse engineering, this one is gonna be tough. I'll see if I can do anything, but the success for me in that task is gonna be almost impossible. Although, I've read that DIGIC 7 are quite the same as DIGIC 6, just dual core, and this kinda makes me wonder why we can't run the DIGIC 6 code on a single DIGIC 7 core? Short answer: because nobody tried yet. Long answer: generally it won't work out of the box, even on nearly identical generations, because the code is tightly tied to Canon firmware. Being "mostly identical" just means most of the code can be reused (i.e. not rewritten from scratch), but it generally needs some adjustments. Nearly every minor firmware update has the functions we want to call at different addresses. At least these will have to be adjusted, but this is generally the easiest step (a bit time-consuming, but can be automated to some extent). Besides, each camera model has its own quirks; even cameras from the same generation will have differences beyond just different stubs. Some very close models are 650D and 750D, for example, but even there, not everything works just by changing the stub addresses. Other close models are 80D, 750D and 760D - in this case, I'd expect the startup code to work out of the box just by tweaking the addresses, but nobody tried. Beyond startup code, I'd expect 750D and 760D to start diverging from 80D. Here, DIGIC 7 is definitely not the same DIGIC 6. There is a new processor, a new startup code, two cores that have to run in sync, a new memory layout, a memory mapping unit (previous models only had a memory protection unit) and so on. Overall, they are based on the same EOS codebase we are familiar with, but that doesn't mean the old code will run out of the box. The similarity I've mentioned was at hardware level, i.e. many peripherals (things other than CPU and RAM) identified on DIGIC 6 could be used to emulate DIGIC 7 firmware either out of the box or with minor adjustments (such as different register addresses). The screenshots you have seen were created with portable code (the recovery branch, which is limited to bootloader experiments). This code attempts to locate firmware functions on the fly, with pattern matching, and can run from DIGIC 2 all the way to DIGIC 7. However, what can be done in a portable way is quite limited and relies on similarity between Canon firmwares. Sooner or later, you will need "if" branches with model-specific or generation-specific code. The DIGIC 7 cameras appear to be very similar; that is, I'd expect most of the knowledge gained by analyzing one model to apply to all others in this group. DIGIC 8 starts to diverge a bit, but I still believe D7 and D8 are a lot more similar than D6 and D7 (they have the same ROM layout, the same startup code, similar - possibly the same - dual-core configuration and so on). Maybe it's best to move M50 in its own thread, but for now I'm analyzing all these models together. One significant difference between D7 and D8: the portable code did not quite work out of the box on M50. Expecting the bootloader changes to be minor, but unable to guess them from the firmware update. The portable code ran, to some extent, so we could tell the code is running and we could change the error screen, but could not display any custom things and could not guess the LED address. Figuring things out that way would have been possible, but tedious; luckily, the firmware update came out earlier than expected. I'm going to implement the startup code for M50, so you can compare it to 80D and see what are the parts that may need tweaking. Edit: committed startup code for both M50 and 200D, as it was easier to debug this way. Testers welcome (contact me by PM). Porting to 6D2, 77D and 800D should now be just a matter of pattern matching (in theory). This sounds promising! Thanks for the links, I'll be checking this out. I need ROM dump file for 200D and M50. 0000F070> PropMgr:001b686f:00:0f:  *** mpu_send(08 06 01 a7 00 01 00 00) ; ??? 0000F18F> PropMgr:996375:81:03: !! Convert End !! 0000FEB9> PropMgr:001b686f:00:0f:  *** mpu_send(22 20 0e 39 00 00 00 00 00 00 00 00 00 00 00 00 00 00 00 00 00 00 00 00 00 00 00 00 00 00 00 00 00 00) ; ??? 000102BF> NFCMgr:001b686f:00:0f:  *** mpu_send(06 05 03 8a 00 00) ; ??? 0001031A> NFCMgr:001b686f:00:0f:  *** mpu_send(06 04 02 14 00 00) ; ??? 00011E26> PropMgr:001b68db:00:0f:  *** mpu_recv(06 05 01 b6 01 00) ; ??? 00011EA5> PowerMgr:001b68db:00:0f:  *** mpu_recv(06 05 01 b5 01 00) ; ??? 00012CB3> PropMgr:996375:81:03: !! Convert End !! 00012CDB> PropMgr:001b68db:00:0f:  *** mpu_recv(06 05 03 76 00 00) ; ??? 00013776> Startup:001b68db:00:0f:  *** mpu_recv(08 07 03 7e ff ff ff 00) ; ??? 0001389F> Startup:001b68db:00:0f:  *** mpu_recv(08 06 01 a7 00 01 00 00) ; ??? 00013B16> PropMgr:001b68db:00:0f:  *** mpu_recv(08 06 01 a7 00 00 00 00) ; ??? 00014241> RTCMgr:001b686f:00:0f:  *** mpu_send(08 07 03 6a 00 02 00 00) ; ??? 00014306> Startup:916511:80:03: srmGetShootMemAreaAddress(): Area isn't Exist. 000161D4> PropMgr:001b68db:00:0f:  *** mpu_recv(08 06 01 a2 00 00 00 00) ; ??? 00016307> PropMgr:001b68db:00:0f:  *** mpu_recv(06 05 03 23 2c 00) ; ??? 000166EC> PropMgr:001b68db:00:0f:  *** mpu_recv(06 04 03 25 00 00) ; ??? 0001745B> Startup:001b686f:00:0f:  *** mpu_send(06 05 01 56 00 00) ; ??? 00017760> PropMgr:001b68db:00:0f:  *** mpu_recv(08 06 01 a2 00 00 00 00) ; ??? 00017BBA> PropMgr:001b68db:00:0f:  *** mpu_recv(0e 0d 04 30 00 00 00 00 00 00 00 00 00 00) ; ??? 0001814E> PropMgr:001b68db:00:0f:  *** mpu_recv(0e 0c 01 b1 00 00 00 00 00 00 00 00 00 00) ; ??? 00019494> FileMgr:001b68db:00:0f:  *** mpu_recv(06 05 04 29 01 00) ; ??? 00029F4B> NFCMgr:9099:3e:03: [BLE] Enter blemgr_SmartphoneGps_CheckState(). 00029F63> NFCMgr:90901:3e:03: [BLE] Enter CheckGpsAndBleState(). 00029F9E> NFCMgr:9099:3e:03: [BLE] Enter blemgr_SmartphoneGps_CheckState(). 0002A04C> NFCMgr:9099:3e:03: [BLE] Enter blemgr_SmartphoneGps_CheckState(). 0002A061> NFCMgr:90901:3e:03: [BLE] Enter CheckGpsAndBleState(). 0002A08D> NFCMgr:9099:3e:03: [BLE] Enter blemgr_SmartphoneGps_CheckState(). 0002A0A0> NFCMgr:90901:3e:03: [BLE] Enter CheckGpsAndBleState(). 0004552D> NFCMgr:907:3e:03: [BLE] Enter blemgr_SmartPhoneGps_NopEvent!!! 0004556B> NFCMgr:907:3e:03: [BLE] Enter blemgr_SmartPhoneGps_NopEvent!!! 0004559D> NFCMgr:907:3e:03: [BLE] Enter blemgr_SmartPhoneGps_NopEvent!!! 000464FF> NFCMgr:9099:3e:03: [BLE] Enter blemgr_SmartphoneGps_CheckState(). 00064885> CSMgrTask:92029:16:16: AllocateMemoryStrictly For Speed Class!!! 000B1800> RscMgr:001b68db:00:0f:  *** mpu_recv(06 05 03 23 2c 00) ; ??? 000B1A2E> PropMgr:99179:89:05: update coded version. 000B1C0F> PropMgr:001b68db:00:0f:  *** mpu_recv(06 04 03 25 00 00) ; ??? 000DFFCE> PropMgr:001b686f:00:0f:  *** mpu_send(08 06 04 24 00 00 00 00) ; ??? 000E03AC> Startup:001b686f:00:0f:  *** mpu_send(08 07 03 68 00 00 00 00) ; ??? 000E0413> PropMgr:001b686f:00:0f:  *** mpu_send(06 05 03 69 00 00) ; ??? 000E04EA> PropMgr:001b686f:00:0f:  *** mpu_send(08 07 03 89 00 00 00 00) ; ??? 000E4B35> PropMgr:001b686f:00:0f:  *** mpu_send(06 04 0e 3a 00 00) ; ??? 000E5919> NFCMgr:9099:3e:03: [BLE] Enter blemgr_SmartphoneGps_CheckState(). 000E5931> NFCMgr:90901:3e:03: [BLE] Enter CheckGpsAndBleState(). 000E59C0> NFCMgr:907:3e:03: [BLE] Enter blemgr_SmartPhoneGps_NopEvent!!! 000F38E2> dump:001b6b17:00:0f: Free memory: 3655028 bytes. So I was playing around with the 6D2 ROM1 dump and it seem to have failed the disassembly part. Somewhere on the forum I read that it might be because the wrong firmware start address that I use with disassemble.pl script. Although I used exactly the same address that was given me by the Firmware Dumper: 0xE0040000. What am I doing wrong? Another stupid question how can I identify the stub (what it actually does so I put it in stubs.S)? Note: my dump is of the 1.0.4 firmware version. Please send to me dump from 6D2 for finding stubs. For Thumb, you will need disassemblev7.pl. Good news is that DIGIC 7 firmware is mostly Thumb, unlike DIGIC 6 which is a mix of ARM and Thumb. There are still a few ARM veneers around; so far I've only noticed direct jumps to Thumb functions. Following a call trace in QEMU is also helpful; that's the method used by find_stubs.sh (which helps, but only finds a small set of stubs and... doesn't work on Mac). The autogenerated IDC files (one with -d idc from QEMU and the other from the GDB script saved by find_stubs.sh) are also very helpful. Hi! I own a Canon 200D, how can I help the developers? 0000F1EF> PropMgr:e00916a9:81:03: !! Convert End !! 00012A92> PropMgr:e00916a9:81:03: !! Convert End !! 00014127> Startup:e0498415:80:03: srmGetShootMemAreaAddress(): Area isn't Exist. 00029F8F> NFCMgr:e03d0d03:3e:03: [BLE] Enter blemgr_SmartphoneGps_CheckState(). 00029FA9> NFCMgr:e03d0c35:3e:03: [BLE] Enter CheckGpsAndBleState(). 0002A073> NFCMgr:e03d0d03:3e:03: [BLE] Enter blemgr_SmartphoneGps_CheckState(). 0002A087> NFCMgr:e03d0c35:3e:03: [BLE] Enter CheckGpsAndBleState(). 0002A0B3> NFCMgr:e03d0d03:3e:03: [BLE] Enter blemgr_SmartphoneGps_CheckState(). 0002A0C8> NFCMgr:e03d0c35:3e:03: [BLE] Enter CheckGpsAndBleState(). 000464CD> NFCMgr:e03db2af:3e:03: [BLE] Enter blemgr_SmartPhoneGps_NopEvent!!! 00046510> NFCMgr:e03db2af:3e:03: [BLE] Enter blemgr_SmartPhoneGps_NopEvent!!! 00046544> NFCMgr:e03db2af:3e:03: [BLE] Enter blemgr_SmartPhoneGps_NopEvent!!! 000474D7> NFCMgr:e03d0d03:3e:03: [BLE] Enter blemgr_SmartphoneGps_CheckState(). 000BE6EE> CSMgrTask:e025b351:16:16: AllocateMemoryStrictly For Speed Class!!! 000F413C> dump:001b6b17:00:0f: Free memory: 4168940 bytes.